ENTRIES NOW CLOSED. Winners announced on 30/10/2012. WIN a pack of limited edition NESCAFÉ Gold Single Colombian blend plus a Lilly's Life Gift Pack with a selection of some of my favourite beauty indulgences (Total value $165). Four runners up will each win a pack of limited edition NESCAFÉ Gold coffee ($10 each). Entry details below. Did you know that Coffee is the second most valuable commodity in the World next to petroleum? I guess its hardly surprising when you look at the City I live and its strong cafe culture. Coffee is integral to most people's socialising. The choice of great coffee abounds and it inspires passion and addiction in many of us. Regardless of how you like your coffee and the ritual that may surround it, there is something to be said for its slow savouring - alone or sharing it in the company of others. Our individual coffee experiences are unique and personal. 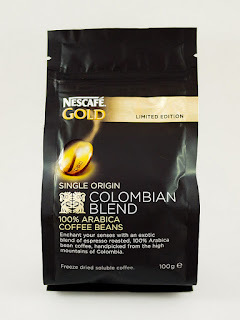 When I was offered the opportunity to try the new Limited Edition NESCAFÉ Gold Single Origin Colombian Blend soluble coffee I jumped at the chance. This coffee is made from 100% Colombian Arabica coffee beans and there are only 5,000 packs exclusively available online in Australia. It is pretty special. My daughter recently went to South America and had her own unique Colombian coffee experience on a farm in Salento. I have been interested in Colombian coffee since. The area is beautiful. Just look at the jaw dropping scenery. ﻿Colombia is the biggest producer of Arabica coffee which is known to be the best of the coffee beans. It has lots of flavour and has low caffeine and acidity levels. The coffee is grown at high altitudes where the temperature and soil are perfect for coffee beans to develop and mature. Most of it is grown in small family owned plantations where the farmers pick the coffee by hand, one cherry at a time. They take great care harvesting their coffee crops. So 15,000 kilometres away from these coffee farms, I was ready to have my own Colombian coffee experience. When I received the NESCAFÉ Gold coffee and an inspirational hamper, I decided to have a get together with friends and family to do a group tasting. As well as tasting the coffee they also tested my 'coffee creations'. I made a Walnut Coffee Cake, coffee cream topped scones (yum! ), coffee cream chocolates, iced coffees (with coffee ice cubes), coffee iced cupcakes - there are so many ways to use coffee other than just drinking it. We all had a lot of fun sharing this very Australian Colombian coffee experience. And none of us had to trek up any mountains on horseback to get our 100% Colombian coffee fix, unlike some coffee drinkers we know. I love the aroma, the taste and the fact it is not overpowering. It was also great in the goods I baked. Everyone was pleasantly surprised that the "soluble coffee could taste so real" (Melbournites and their coffee!). Here are a few comments from others, "I like that it is not overpowering". "It doesn't have that bitter taste you get with most coffees". "It's got a classic aroma." "This tastes like real, normal coffee." "It is earthy tasting." "Rounded finish but I thought it lacked a bit of taste upfront." "Smells like real coffee and is very strong in a good way." The Winner will receive a pack of the luxurious Limited Edition NESCAFÉ Gold Single Origin Colombian Blend (RRP $10) PLUS a Lilly's Life Beauty Gift Pack containing a few of the little beauty luxuries that I love and would like to share with you (RRP $155). In addition, FOUR more readers will each receive a pack of Limited Edition NESCAFÉ Gold Single Origin Colombian Blend. Please note that I received a NESCAFE GOLD gift hamper to create my own coffee experience and a pack of Limited Edition Coffee to review. I received no money for writing this post and reviewing the product. The views expressed in this post are my own and those of family and friends who tried the product. Apart from that, I like my coffee strong with skim milk and no sugar. I need the kick!! I drink long blacks all day long. Then switch to wine he he when the sun goes down. It keeps me awake. She went to Colombia? Gee whizz she is brave. The coffee may be good but how is the crime there? Your baking looks scrumptious too. I like it to be hot, in a clean cup (cup to have been cleaned by someone else), and made and poured by someone else, preferably in a great Cafe. I like my coffee black and hot too. I have been to south America and its amazing. lovely tribute to coffee today Lilly, and have fun with the contest! You are certainly having some awesome give-aways. Thank you for my win today! I'm so excited! I've lived in Seattle Washington for 12 years. Coffee is a way of life here, almost like a religion, and I worship every morning with 1-2 cups of coffee with a little Coffeemate. I don't like to use a liquid creamer, because it cools the coffee too fast. No sweetening necessary! On weekdays, I drink my coffee fast, because I'm too lazy to get up early and I need to get to work. But on the weekends I savor my cups of joe, taking time to appreciate the smell as well as the taste. My parents drank Nescafe coffee when I was a kid (back when the world was much younger). So I'm going to check out Nescafe Gold! Back in the day, dear Lilly, I was a Heavy Coffee Drinker---Real Coffee and Nescafe, too--maybe 15 cups a day....I gave it all up almost 40 years ago---I switched to De-Caf...BUT, gave that up too, almost 30 years ago, except on very special occasions---Funny how these things can change. Is this Nescafe supposed to be very very different from what they did all those years ago? It sure sounds good! Though, in truth, I have no desire to drink coffee any more, at all. In fact, it seems like another life....Drinking coffee and Smoking. WOW! Both, L-O-N-G Gone in my life...! 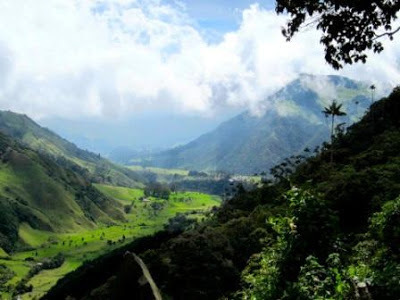 How pretty does Colombia look in those pictures. I kind of think its nice to know where our coffee is coming from and who grows it.I guess most of the good coffee gets exported like happens in Brazil too. Such gorgeous landscapes. I go to the same cafe every day for my late. Same routine, its just part of my day. This blend looks interesting, I like my coffee strong. I just discovered your blog via Three Lil Princesses. I like my coffee first thing in the morning before anyone talks to me! I never drink coffee after noon and I like it like I love my man, white, strong and a little bit sweet! I get the perfect coffee every morning, my husband makes it before I wakes up and brings it to me in bed, along with kisses and cuddles. Best way to start the day. Lucky you, hang on to him! The way i have my coffee is STRONG, if i dont have it strong, without my coffee im a bit of a cranky girl. like my coffee mug says " no coffee, no love"
This looks good because unlike many coffee snobs I happen to like freeze dried coffee the best. I have aobut 5 cups a day which may be a little excessive is it? I would love to try this one, being a limited edition and all. I like Nescafe, may faovurite brand. I like my coffee tall, dark and piping hot - same characteristics I look for in a man really! Sandra, that is hilarious!I am so borrowing that line. Just like me.Its special coffee lol. I like mine EXTRA HOT, with unsweetened soy milk. Not that I can drink it right away, I always just sit and wait till it gets warm. Weird habit, I know. I prefer my coffee served up on a tray, with home-made almond cookies, a daisy in a crystal vase & of course only the best china will do. Now to just train up the dog or believe in fairies. What? You don't believe in fairies? But in the real world I like it strong with a bit of sugar and milk. a coffee thats true with no hype!! I love espressos and the best I have ever had was in Sorrento Italy.I would like to try this one though, sounds good, thanks. Black, black with black is how I like my coffee. We have Nescafe Gold here and I drink it every morning! It is soooo good and whoever wins this will be so lucky. The aroma is out of this world and when I have a cup sitting in my office, people tell me they smell it from the corridor already. Love it! How about this i do not like to drink coffee but i use it to make coffee sorbet and ice cream. I would also like th erecipe for your Coffee walnut Cake too. so I am a coffee user but I eat rather than drink. I love your pictures, very beautiful. I like a long black every day before my breakfast. It gets me started for the day ahead. I am not a coffee drinker, but a coffee eater! I love making a range of recipes with it, including coffee truffles, coffee shortbread, coffee mousse, and coffee macarons! I worked in a cafe for 7 years and have made my fair share of coffees in my time! You just made me so hungry.That sounds amazing. I love coffee in every way possible. Over the past 10 years I have drunk the following - do I qualify as a coffee lover? I think I need to expand my coffee menu after seeing that..never heard of half of them, lol that might go on my bucket list. I'm more of tea girl but I do love sharing a coffee with a friend over a good chat. OMG what a spread you had - the Walnut coffee cake sounds divine. 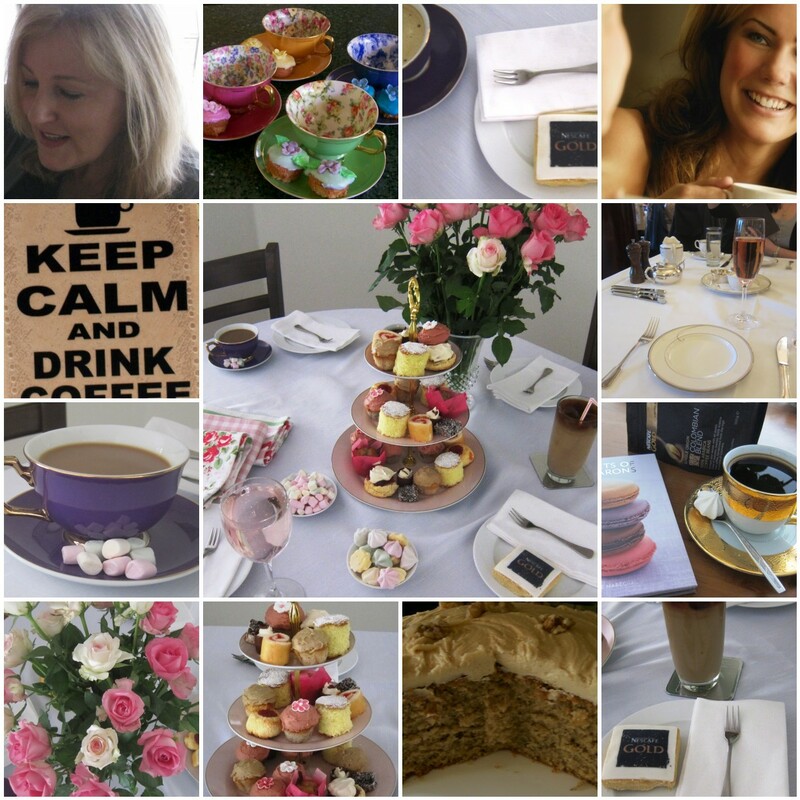 Tea never tastes so good in a cafe ...unless it's High Tea at the Carrington Hotel in Katoomba. I like my coffee hiding in the pantry form the kids. I like my coffee just a little white, out on my patio in the sunlight while I am reading a great magazine. Email address to Wufoo entry. Email address sent on Wufoo form to your email address. As a wake up call in the morning after I've "bean" asleep. Fresh from the Adelaide markets each week, beautiful aroma that fills the car all the way home. Email address sent via Wuffoo entry form. HOT with extra coffee and preferably in the biggest mug I can find. Email address sent via the Wuffoo entry form. Love my coffee when it's keeping my hands warm and I am listening to some girlie gossip! I like my coffee rich, mellow but strong -the same way I like my men! I can understand why coffee would be such a valuable commodity. Whether you drink it or not it is part of everyday life. How many people start up relationships over a cup of coffee or end their relationships over a cup of coffee. I like my coffee, preferably as soon after I wake up as possible. I prefer my coffee to taste and look like mountain dew!! My boyfriend prefers his in a mug!! I'm not a coffee drinker, but my husband is so when I win the coffee is for him and the other items are for me. It;s a win win situation !! Thanks for the giveaway !! P.S. I LOVE the smell of coffee just not crazy about the taste. Wufoo form submitted with email details, thanks. I enjoy my coffee black and hot most often. Occasionally I'll do one of the more dessert type (my opinion) of arrangements that may include ice and spice. I visited Greece once on a business trip long ago and still remember the scene in the conference room where these older coffee watched for my reaction to a very strong espresso - it was certainly high octane. Yes that reminds me of going to southern Italy and having an espresso that literally resulted in smoke coming out my ears. It was also interesting in that there only ever seemed to be men lounging around the cafes drinking coffee. Not sure where the women were - home doing housework perhaps. It was like stepping back into another century. I love a little coffee with a not so little piece of dark chocolate. It is my little slice of luxury in an otherwise busy day. Freshly ground, hot, right after it gets done steeping. I usually put in caramel macchiato creamer, mmm so good! I love using a milk frother and getting a big dollop of foamy milk on my coffee! It makes it taste so much richer! As the old saying goes coffee should be strong & dark like chocolate and men. But honestly I'm happy if my husband has made the coffee (and hes not dark and not particularly strong but I love him anyway). I prefer my coffee, sitting in a quaint cafe in the St Germain des Pres district, shooting the breeze with Brad Pitt and munching on a pain suisse aux pepites de chocolat. Bliss. Well now I've woken up from that dream I'll get up, put the kettle on and have a long black while I put the washing on. With froth - getting a big tick! Strong! So you can taste that it's coffee that I'm drinking! Love my coffee, my primary indulgence in life!!! I prefer my coffee black, on a gray rainy day here in Portland OR (thankfully I have lots of those types of days)! I have to have my coffee hot, black, strong and lots of it. I love my make up, men and coffee STRONG and BOLD. Your pack and limited edition Nescafé Gold could have me dating your blog. freshly ground and brewed with a hint of cinnamon.....if its the proper blend and grind, black. Hot preferably - somethng that doesn't seem to happen very often nowadays with 3 kids 4 and under! Iced with a good scoop of vanilla icecream! I like going for a sneaky coffee on my own away from my kids and husband when I am out doing the grocery shopping. A flat white and a bit of time on my own to collect my thoughts and relax is pure bliss. Flat white, full bodied and with a lasting kick! Black, Strong, made in a plunger on a Saturday afternoon, on my own with a very good book. Strong and black with just a hint of sugar. And it has to be Nescafe! none of that other horrible stuff! i say wake up and smell the coffee and I do that, coffee is my buzz for the morning. I like my coffee strong to provide the caffeine induced motivation needed to tackle the morning chaos. It's drunk in quick sips while trying to make breakfasts, school lunch, change nappies, locate bags and shoes and wrestle clothes onto my apparent aspiring nudist children. It then usually accompanies me to the bathroom too, where I apply my make-up one handed, using the other to catch my 2 year old as he attempts a crude gymnastics routine between the toilet and vanity! I love the weekends, when I can sit back and just enjoy a great coffee without having to rush around! Very hot, white & no sugar. Black, strong and made by someone else! Made by someone who loves me! Frozen. For some reason I only like home made Coffee icecream or coffee cake. I can't stand hot drinks! Coffee Ice cream, or even coffee sorbet - completely yum, why didn't I think of that? White with two - and preferably brought to me by someone else while I relax on the couch! I am a college student who commutes into the city to get to school in the mornings; I live about an hour outside of town, and I drink my coffee on the way in to wake myself up for class. I'm not much of a hot beverage drinker unless it's super sugary; I like to put so much creamer and sugar into my drink that it turns nearly white instead of brown. Recently, one of my friends also turned me on to the idea of pouring chocolate syrup into the mix. It's fantastic! When I have my coffee, I want to feel like I'm drinking candy. in my wedgewood cup, hot and strong and as often as possible. Hot and strong just like my man! I put cinnamon in the grounds before brewing. This gives the coffee a more complex flavor, and makes sugar or milk unnecessary. Alone, with my thoughts, to savour. I like my coffee strong, and warm. I top my coffee with 2-3 marshmallows, and a dollop of thickened lite cream. Have a bath,kick back &relax with a coffee OR have a shower pop on the earings,go party &recover with a coffee. In big mugs!! With milk, something yummy to eat and a good book to read. T~remendously rich - creamy as silk! I prepare my coffee in the washing machine method. Fill, swirl, purge, plunge, heat and final enjoy the fresh aroma. In the morning, repeatedly during the day, and in the evening! Give me my coffee on auto pilot through a beer guzzling hat and I am a happy camper. Can't make it through the day without feeding the caffiene addiction. With frothy milk, on a gondola through Venice with someone massaging my feet. And a hint of Baileys. Other than that, any time, anywhere. Mmmm... Coffee is so versatile. I love it in chocolate mouse, in tiramisu, as flavouring in my Baileys, in cake but mostly, I'm content with a lovely latte made for me early in the morning by my husband when Dora has decided it's okay to get up before the sun. White. With nothing added except milk - no flavours, no sweeteners, nothing else. Preferably served to me on a platter accompanied by a shortbread biscuit by a manservant whilst I relax on a lounge chair by the pool in the mansion that I purchased with my imagined lotto winnings. Have you been reading my mind Tracy? It used to to be hot, steamy , awful sweet & real creamy. Like my wife used to be in years gone past. But now we have hit retirement age, I seem to have it rather cool and not to sweet. I prefer my coffee religiously in the morning with 3 sugars unsure why just always have and one nightly one after dinner just slightly weaker, but always in good company to have a chat and warm the fingers up if its a cold night! Skinny Cap with no sugar, perfect way to start the day, before the crazy ones awake. I like a smooth strong cup of coffee. The type that would put any normal person in a head spin or make them feel so exhilarated they thought they had just come off a roller coaster! Well my coffee experience doesn't take me on a ride, I take it on my roller coaster ride of life and there is no room for DECAF passengers!! Like a roller coaster I start of slow in the morning, regular coffee intake helps me rise up and over the highs and climb out of the lows of the day very quickly. You could say it was mt engine fuel!!! This is mostly how I function during the week but weekends are a different story! I guess you could say I use coffee as a stimulant during the week but on weekends it is for relaxing and enjoying what life has to offer. Rather like a ferris wheel I guess. I weekends I like to sit at the top and watch the world buzz around at the bottom. It all looks so insignificant from up here! So as you can see I have a serious coffee addiction, I need it, I want it, I love it!! It's my stimulant and relaxant and yet I sleep like a baby at night. That part has always puzzled me!! A 97 year old client got me hooked on a good Italian coffee, seems to be his ticket to good health. I also love a cup of Nescafe. At the moment decaf as I am a new mummy (breastfeeding) which is not great but normally I like it sweet with skim milk :) Can't wait to get back to my coffee habit! I put some cinnamon in the before brewing,this gives coffee more complex flavor with cream and sugar love it. Makes my tastebuds CHA-CHA feeling alright! A morning kickstart to reach my goal!! Like my men, strong and tasty! My friends and family laugh out loud when I order my coffee- quarter strength skinny cappucinno- they ask me why i bother!! Strong and hot just like my man. I love my coffee the same way I like my men. Strong, creamy dreamy, with a little sweetness thrown in. 50 Shades of Pale...weak like my men! hot and strong - just like my men! Husband? Dark, strong and hot! ..... just like my coffee! Hiya Lilly, I've just been reading through all these entries and they are amazing, never knew how many hot, strong men there were in Oz or how many different ways there are to have coffee, lol. Nescafe should love you. I love opening a new packet of coffee and smelling the aroma - sometimes I just do this (if I've already had too many cups for the day). Hot, fresh, black and first thing in the morning -i'm talking about coffee people, coffee!! Beautiful and fresh, made by my favourite barista at my local cafe. He ain't bad looking either! Made by my husband nice and hot and only Nescafe Gold of course! First thing in the morning. Quick. Hot. Strong. Creamy. Delicious. Stimulating. Satisfying. Exhilirating. However, I love coffee so much I will not edit my comment. Freshly roasted and in its purest form... long black no milk or sugar! YUM! A Flat White with a strong and robust taste, and an aroma that awakens me to the daily ' grind '. It tastes much better when a male with no shirt and buff body brings it to me in bed. In dessert.... Tiramisu, flavouring my ice-cream too. But if I miss out , I get quite rabid. I love Nescafe, medium strong with full cream milk, in a very big cup. I like to eat a little chocolate along with my coffee! Home-made Iced Coffee! 2 tsp coffee, 3 tsp sugar, a bit of hot water to dissolve and top with 500ml milk. Definitely not good for me but it taste better than instant coffee in ice cube form! ready for me before I wake up - although that doesn't happen ever!